What an emotive term… ’Concrete Cancer’ like the human kind, it can kill the building if not stopped. Concrete cancer is rust – specifically within reinforcing steel. So how does it happen; how is it identified and how can you stop it in its tracks? Why is concrete and steel used so often in construction? Concrete and steel are used together because concrete is strong under compression and steel is strong under tension, making them ideal building partners. They also expand in heat and contract in cold at the same rate preventing cracking. So how does this partnership fail? You need three ingredients – Iron, Water and Oxygen. When moisture hits steel iron, it combines with carbon dioxide in the air to form weak carbonic acid. As acid is formed and iron dissolves, some water starts breaking down into it’s components – hydrogen and oxygen. Then the oxygen and iron bond into iron oxide freeing electrons, called rusting. Some buildings are more prone than others to concrete cancer. • Buildings built before July 1997 generally have less concrete surrounding the reinforcing steel. The standards changed in 1997 requiring more coverage. • Buildings near salt water – salt in the air / salt spray accelerate rates of oxidization (rust). • Buildings near high smog areas (e.g. Buildings beside busy roads or industrial areas). The smog… also reduces the life of the buildings coatings. • Buildings that are not regularly painted. We suggest painting at least every eight years. There are no building coatings we know of that prove to be waterproof after eight years. Just because it looks okay does not mean its waterproof. • Reddish/brown stains adjacent to cracked concrete. • Reddish/brown stains running down any part of a building. • Concrete lifting/exploding out. 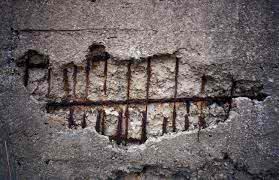 If concrete starts lifting for no apparent reason often rusting in the reinforcing steel is the cause. • Other cracks with signs of moisture coming through are potential problems. Look out for cracks showing white crystals or fluorescence. Basically once water enters a crack, it’s usually only a matter of time before the water breaks down into hydrogen and oxygen leading to oxidization. In all these cases, it is important to investigate and find the cause. The cost of letting concrete cancer spread is massive, but there’s great products to stop rust and re-seal surrounding concrete. If a steel reinforcing bar is eroded by more than 30% of its diameter, then the whole thing (concrete and steel) needs to be fully replaced. We are talking massive expense here. Don’t let it happen to your building. What do you do to stop concrete cancer? • React quickly to cracks with white crystals forming or where reddish/brown staining is leaching from the crack. o Planter boxes that are leaking and/or are being over watered. o Areas where water is used frequently like car cleaning bays leaking to areas underneath. o Roof and balcony membranes that are no longer water proof. o Leaking air conditioning units where condensation is not piped into storm water or where tongue dishes are failing. • Get an independent recommendation by someone who knows the latest products and techniques to use. • Use an independent expert to approve and measure all concrete cancer treated. Normally the charge rates are quoted on a per lineal metre basis. If you leave the contractor to measure this themselves, you are in effect giving them an open cheque book. How do you repair concrete cancer? 1. The spalling concrete around the reinforcing bar is chiselled away. Some companies are using high pressure water jets to do this now. Check with an engineer if this is advisable on your project. 3. An epoxy, mortar epoxy and/or concrete used to patch the area. 4. Cracks are repaired using a technique called ‘crack injection’ where suitable epoxy resins or special mortars are injected. This may include a negative membrane which repels water. Negative membranes will not prevent water from entering the concrete; merely shift the water’s direction through the slab. 5. Treatment of concrete cancer must incorporate proper waterproofing or risk being a temporary solution. It is recommended that the area is re-painted/re-coated. Be aware that the problem is very likely to be much more extensive that what is apparent on the concrete surface. The cancer will have spread along the reinforcing in each direction. It is impossible to know the extent until the concrete is chiselled away. If the signs are there that concrete cancer is starting in your building, act quickly. The most important fact in this article is that once more than 30% of a reinforcing bar is eaten away the bar is structurally worthless. Fixing concrete cancer is expensive; replacing reinforcing is a whole new world or expense. Some buildings have been condemned because the owners did not act quickly enough. Act quickly, in fact act now. Owners Corporations that require help with organizing building inspections, defect reports, or remedial works concerning Concrete Cancer can contact PRECISION STRATA for assistance. We can organise for a building inspection and defect report to be undertaken to highlight early any potential issues that require immediate attention.